What would happen if your Past, Present, and Future all walked into the SAME bar one night? Would Past recognize Present and would those two know recognize Future? Would Past take the time to sit with Present and have a heart to heart?Would he sit back in his chair, shake his head and marvel at Present? Or would he keep it moving? Past doesn’t want to have any regrets about Present. He expects the passage of time to be kind, to be fruitful, to have purpose. He expects to look in Present’s eyes and see a being who is at peace with where he is; with heart and mind set on greater things in Future. If Past steps up to Present and sees a “white washed grave” staring back, oh boy, that’s not good. Glad you pulled through. Heard all good things about you. I’m so happy for you, Present. You done my heart good. I had my doubts there for a minute. You know people talk. Word on the street was you were left for dead. Your mind and soul was up for grabs by the highest bidder. Folks said… (Present sits there humbled, near tears, at a loss for words). Meanwhile Future sits at the bar with his back turned to Past and Present. Bartender keeps the ginger ale on the rocks coming. Future is sober. No drinking here. He’s heard the whole convo. He shakes his head and chuckles to himself–cause if PRESENT ONLY KNEW WHAT HE KNEW. Past wouldn’t be able to identify Future in a line up. Cause if he could, then life would have been a colossal waste of time. It’s best that Past can’t. Future likes it that way. Present would come close, but not close enough. “Keep ’em guessing” is his motto. Music loud, people talking, he knows he is being watched by those two who are eager to walk over and say hello. There will be time enough for that. Not today. Not now. 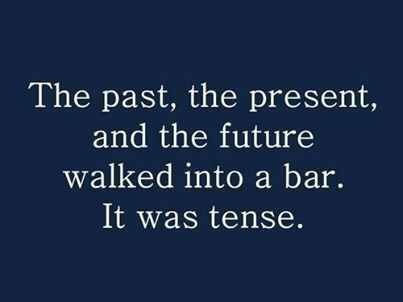 You see Past doesn’t have a place at the bar with Future. Those two have nothing in common. Truth be told Present really doesn’t either. Not unless Present makes amends with Past. Then and only then can Present move on to Future. It was nice to sit and exchange some words with Past. Past is a reminder of what you have gained, lost, or left behind. A reminder of lessons learned, of triumphs, of losses. Past is not a place to dwell and make your bed. Past is not where you set up camp and never leave. Rather, Past is a mile marker on your way to the Future. Present: Hey Past, it was really good talking to you. I got some things off my chest. That was good. Past: Alright man, (sad, yearning face). Check ya later? Present: Nah, more like goodbye.